Home World News North Korea 'Leading' on nuclear plan, defector says". North Korea 'Leading' on nuclear plan, defector says". 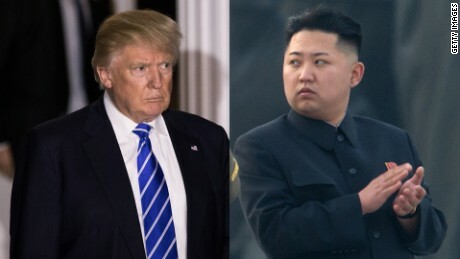 Political uncertainty in the United States and in South Korea could give North Korean leader Kim Jong-un "an apt time" to develop nuclear weapons "at all costs by the end of 2017," a high-profile North Korean diplomat who recently defected to South Korea said Tuesday. "Due to domestic political procedures, North Korea calculates that South Korea and the US will not be able to take physical or military actions to deter North Korea's nuclear development," Thae Yong-ho, formerly No. 2 at the North Korean Embassy in London, said in a news briefing, according to the Yonhap News Agency. Thae said Kim has no plans to give up the country's nukes even if he is offered huge sums of money, saying the leader is "racing ahead with nuclear development after setting up a plan to develop it (nuclear weapons) at all costs by the end of 2017." President-elect Donald Trump signaled last week that he will look to "strengthen and expand" the US's nuclear capability, tweeting, "The United States must greatly strengthen and expand its nuclear capability until such time as the world comes to its senses regarding nukes." Trump's comments came hours after Russian President Vladimir Putin also pledged to enhance his country's nuclear forces. Pyongyang will try to open dialogue with Seoul and Washington's new administrations as a nuclear-possessing state, Thae predicted of the North's strategy to obtain a nuclear power status. Until then, North Korea will continue to launch military provocations and conduct nuclear tests in a bid to frustrate Seoul and Washington's sanctions-concentrated policy towards Pyongyang, Thae said. "North Korea believes that relentless provocations must shift new (South Korean and US) governments' policy lines into more stability-focused ones," he said according to the Yonhap News Agency, one of the few outlets allowed into the briefing. North Korea has recently stipulated a dual nuclear-economic development policy to be part of the ruling party's official platform, but in reality, the decision puts nuclear development at the top priority, he said. "Following the ruling party congress in May, Kim Jong-un made it a party policy to finish nuclear development within the earliest time possible," he told the news agency. Director of National Intelligence James Clapper said in October that it's a "lost cause" to try to get North Korea to surrender its nuclear weapons. "They are under siege and they are very paranoid. So the notion of giving up their nuclear capability, whatever it is, is a nonstarter with them," Clapper said in remarks at the Council on Foreign Relations in New York. "The best we could probably hope for is some sort of a cap." Tuesday was Thae's first appearance to the media since he escaped his post in London to take refuge in South Korea along with his wife and two sons in July. Educated overseas and having spent decades at foreign posts, the 55-year-old Thae becomes one of the highest-ranking North Korean officials yet known to have defected to the South though some senior-level defections are not known to the public as well. He plans to join a South Korean national security think tank starting next year as a researcher. South Korea's National Assembly impeached President Park Geun-hye earlier this month over a corruption scandal. It's now up to the country's Constitutional Court to deliberate the impeachment motion, a process that could take up to 180 days. Park said last month that she would resign if "the National Assembly sets a path for the stable transition of power."